Today I'm playing along with Runway Inspired Challenge #5! Even though I've been a fan of the site since it's inception, I have never gotten a chance to play along until today. This week's inspiration is from the Honor Spring 2012 line. I was inspired by 2 elements of the look: the tone-on-tone pattern and sheer fabric of the top. To get the same tone-on-tone look, I thought I would use my PTI mehndi medallion impression plate on vellum. My first try with just the impression plate on vellum was pathetic. Only traces of the outer edge of the design were visible on the vellum. So for the next try, I did fake letterpressed it. I lightly brushed my white ink pad over the medallion design before running in through my machine. I really like soft and subtle look this technique produced. Just a tip: Use the ink very sparingly and wipe away any stray ink bits before pressing. I glued the vellum overlay across the top and left the bottom unattached. To cover up where the vellum is glued to the base card, I created a popped up layer across the top. To create the decorative edge I used the negative side of the Victorian Lace border by PTI (gotta love double-duty tools). I used my new favorite grey (Slate by A Muse Studio) for the sentiment for a softer look. I'm so pleased with how this card turned out! Thanks for taking a look! Seriously EXcellent take on the inspiration! This is absolutely gorgeous. Thanks for the tutorial as well. This is one of those cards that would have me scratching my head and thinking 'how did she do that' It's so stunning--I'm going to pin and try to make one myself--I love that Mehndi plate and hardly ever use it. Nice touch putting that die cut over the vellum adhesive. Ohhh mmmyyyy gossshh JJ!! This is the prettiest thing I think I've seen all week. I am really struck by the gorgeous color and the embossed texture. You captured the inspiration photo perfectly. This is absolutely gorgeous. I love it. So soft and pretty. Ann Y.
Wow this card is fantastic... Just beautiful! Your card is Beautiful! Excellent take on the inspiration photo given. Wow. 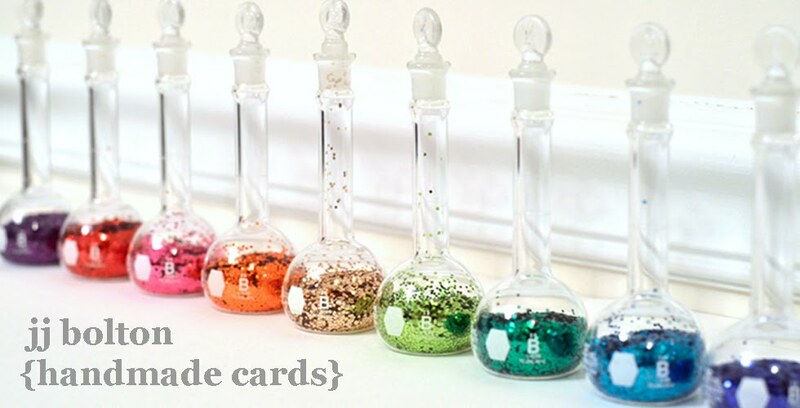 I made my cards with vellum also. But this is stunning! JJ, what a fabulous card! I love how you did the vellum and ink pad trick. (gotta love letterpress). And the slate ink is just the right shade of grey. Absolutely beautiful card! Congratulations--you are a Fashionista. Nice job! This is so beautiful, JJ! 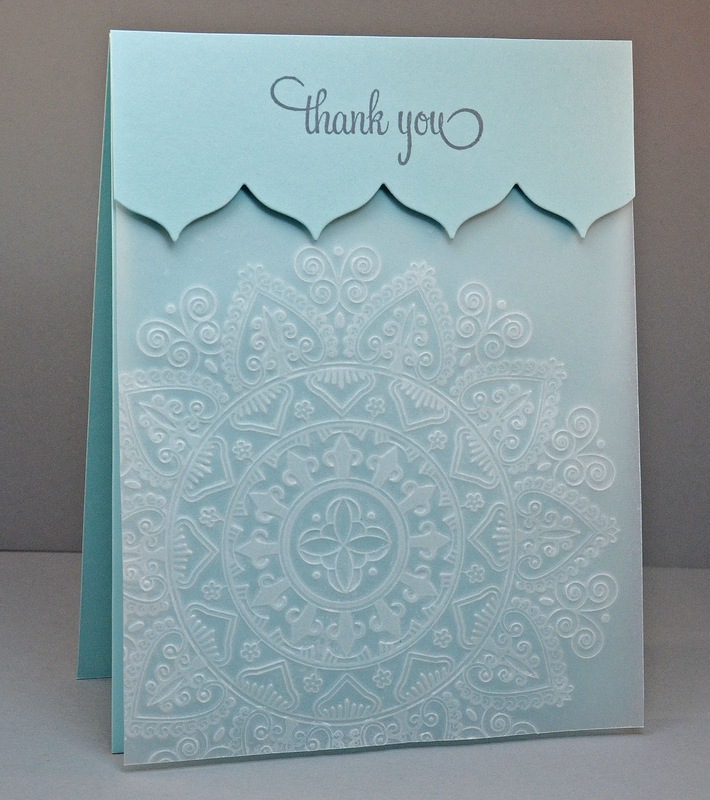 Congratulations on being a Fabulous Fashionista, well deserved with this gorgeous card! DROP.DEAD.GORGEOUS! 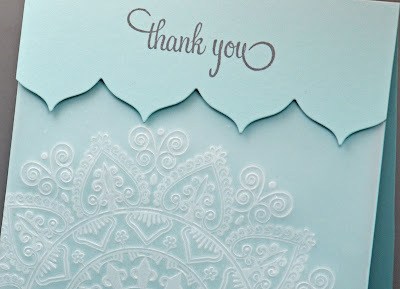 I love the idea of embossing that on the vellum...it's amazing, JJ! What a great card. Soft, pretty and gorgeous such a great take on the challenge!